Let's face it- there's something more sophisticated and adventurous about drinking imported wines, especially from France. However, the charm evaporates when you encounter bitter, austere, or otherwise "challenging" wines when you're just looking for something delicious to serve your guests. Especially when they're expensive. 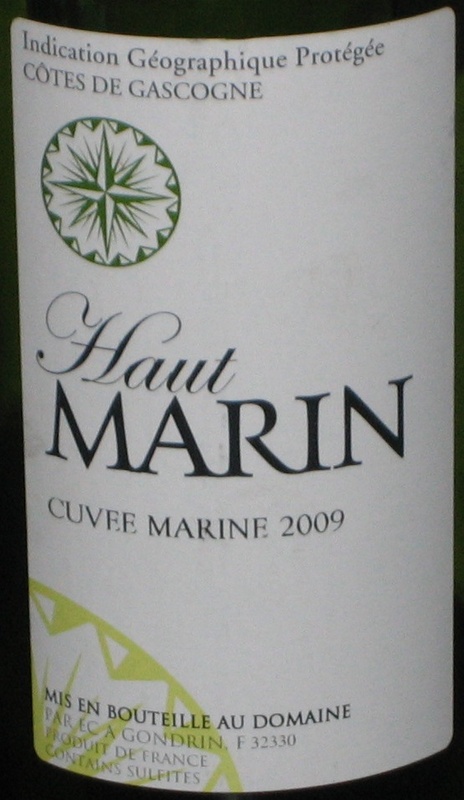 Maybe it was the occurrence of the word "Marine" on the label but I thought this wine was "of the ocean" on a number of levels. It had this really enjoyable slightly-salt-watery characteristic that made me think it would pair well with oysters. It also offered tropical aromas- bananas even. Combined with just the slightest hint of effervescence, this makes for an excellent summer white wine with well-balanced fruit flavor. It seems to happen to me every year. The weather starts to warm up and we have dinner out on the deck and crack open a delicious rosé. I swear I'm going to drink nothing but white and pink wine all summer long! Then reality sets in and I scurry back to my comfort zone which is still juicy new world reds. But when you catch an affordable, delicious, guzzleble rosé it's hard to imagine one that's not utterly enjoyable. Unfortunately, this Fontenille didn't quite deliver for me and the guests I served it to on a hot summer afternoon. Smells of delicious strawberries, but a little thin and bitter flavor-wise. Though it's only 12.5% alc guests noted that "you can definitely taste the alcohol". PS The wine I had at the beginning of summer and liked more was this one from Zepaltas. The hype surrounding 2009 Bordeaux is a little different then 2005. Whereas everyone seemed genuinely enthusiastic about the quality of the 2005s everyone seems uniformly stunned by the high prices of the 2009s. Some of the retailers I trust most are suggesting there's limited upside in buying these wines as futures for a variety of reasons. 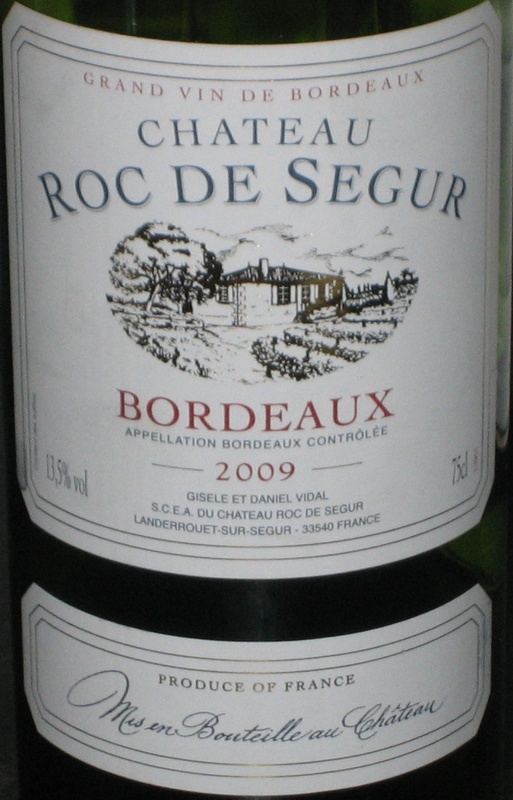 Sold almost entirely always as futures at this point (as in: pay now as part of a straight case or six-pack if you're a pauper, pick up in a year or two when they arrive) I've noticed a few retailers nationally offering this Roc de Segur as a first-look 2009 red Bordeaux. When I opened this wine, my first impression was unfavorable. It smelled like run of the mill red wine with Home Depot-esque wood notes wafting above the glass. After some attempts to save it with various wine aerators things improved a bit but I decided to save it for the next day to see how it fared. Fortunately, things were looking up the next day! I'm not familiar with the composition of this wine, but it tasted like a Cab Franc to me the second day. Green peppers and spice on top of a more solid foundation. It even held on and showed well a 3rd day, which is something I see consistently in red Bordeaux at all price points: It fares well on the counter overnight with a stopper. Now, the fact that a wine lasted three days around here says something: It wasn't too hard to resist. This one definitely needs time to settle down, but the question I'd ask is how much space do you want to devote to laying down cheap Bordeaux? Check out the notes from Garagiste posted on CellarTracker. Question of the Day: Have you had any of these? If so, what did you think of them? If not, any tips for good affordable French wines?